Illustration courtesy of Meade Optical. 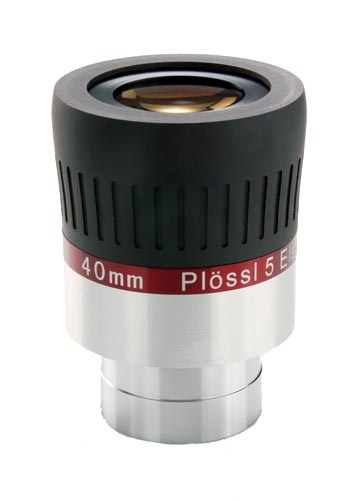 Meade calls the 40mm Series 5000 2" eyepiece a "Super Plossl," but in fact a Plossl is, by definition, a four element, symmetrical optical design. This Meade is a five element, essentially Erfle, design. Why they do not call it that is apparently a marketing decision. Whatever they call the design, they claim a 40% improvement in correction for edge distortion and chromatic aberration over their standard (four element) Plossl eyepieces. 2" oculars are inherently large and this is an impressive eyepiece. It is not marked for country of manufacture, but we believe it is made in Red China. As with any Meade product, it is the lack of quality control and customer service that you must worry about. Of the last four Meade eyepieces we have received, two had foreign objects (in one case an eyelash) trapped between the lens elements. Another was optically defective, the entire center of the field of view being fuzzy. The fourth, the 40mm 2" Series 5000 that is the subject of this review, is fine. If you choose a Meade eyepiece make sure you inspect it very carefully, especially inside, because the manufacturer does not. Also, make sure that you can return it to the store for a refund or exchange if, when you get it home and test its optics, it proves to be defective. Do not rely on the one year Meade factory warrantee, as their customer service is notoriously bad. That said, the reasonable discount price of many Meade oculars makes them an attractive option and if you get one that is manufactured correctly, it should be a good performer. Our subject 40mm Series 5000 is a good example of this. It looks like a high quality ocular and its external finish is very attractive. The optical glass elements are index-matched multi-coated and their edges are blackened. The inside of the lens barrel is painted flat black and ridged to decrease internal reflections and maximize contrast. The outside of the mounting barrel is chromed and the inside of the front lip is threaded for standard 2" eyepiece filters. The eyepiece is nicely finished on the outside and it is supplied with top and bottom lens caps. The upper half of the outer barrel is covered by a black rubberized gripping surface; the lower half is silver brushed aluminum. A burgundy band around the middle of the ocular is engraved, "MEADE 40mm Plossl 5 Element." As mentioned, this is deceiving, as it is not a Plossl design ocular. Rotating the outer barrel extends the eyecup. The overall quality of the materials used in this eyepiece appears to be good, as is the optical design. As you can tell from its size and weight, this is a large eyepiece and it would be inappropriate for small telescopes. We tested it on Vixen VC200L (8" catadioptric) and Stellarvue SV115T (4.5" APO refractor) telescopes, both of which come with 2" focusers and are large enough not to be overwhelmed by 2" eyepieces. This 40mm Meade is shorter than our 42mm Vixen LVW and 32mm Celestron Ultima LX 2" eyepieces, but heavier. In maximum diameter, it is similar to the Ultima and noticeably fatter than the Vixen. Of course, the most important thing about any ocular is its optical performance. In the case of our 40mm Meade Series 5000, its performance is good. It is clearly superior to a 56mm Meade Series 4000 2" that we have used and comparable with the (more expensive) Celestron Ultima LX eyepieces we have used. Due to its long focal length and wide 60-degree apparent field, the 40mm Series 5000 is especially useful as a "sweeper" ocular, used to locate dim objects in the night sky. Once an object is located, a higher magnification eyepiece can be substituted, if desired. It also provides fine wide-field views of large objects, such as open star clusters. The true field of view in our Vixen VC200L (1800mm focal length) is 1.33-degrees and in our Stellarvue SV115T (800mm focal length) it is a mighty 3.0-degrees. The 40mm Meade provides bright, sharp and contrasty views across its field of view. Color rendition is natural. The twist up eyecup is very useful for setting the optimum eye relief. Eyeglass wearers will want to leave the eyecup all the way down. The ocular lens measures about 39mm in diameter, or about 30% larger than the ocular lens in a typical 40mm 1.25" Plossl eyepiece. It is an easy eyepiece to look through. We aimed the Vixen, which is a flat-field telescope, at the center of the Milky Way and were rewarded with a most impressive view of this crowded star field. Just beautiful! We think that purchasers will be pleased with the performance of this 40mm Meade Series 5000 2" eyepiece. It provides very nice wide field views when used in suitable astronomical telescopes. If you haven't previously used a 2" sweeper ocular, you are in for a pleasant surprise. Copyright 2012 by chuckhawks.com. All rights reserved.